An absolutely bizarre Demons-inspired death metal horror film that has trouble making up it's mind regarding what it wants to say. I can't tell whether Black Roses is an advocate of hard rock and heavy metal, or a finger-pointing cautionary tale. Either ways, it's a pretty fun small town romp featuring a surprising amount of Evil Dead inspired puppetry and practical effects work (my favorite being a demonic speaker that attempts to eat it's listener). The film's also got an odd assortment of pervy moments that work more as derailment rather than nods to the genre. One in particular finds a forty-year-old teenager fondling her breasts in front of a mirror, in the most awkward of ways, for approximately 2 minutes - the camera transfixed throughout, never once allowing anything but her breasts into frame. If the intention was arousal - it didn't work, but its unintentional humor does add to the schizophrenic nature of the film's personality, so there's that. 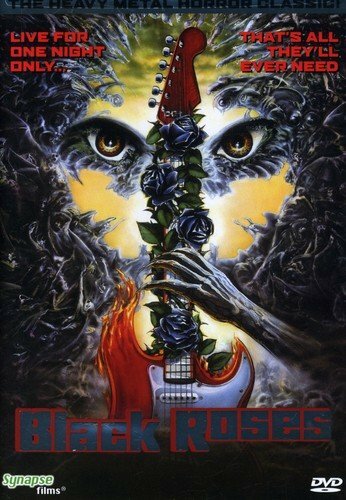 Ultimately, I think the commitment to disjointed nonsense is what ironically pulls Black Roses together, gives it it's charm. So if you're looking for a midnight film, perhaps something a little chintzy, a little 80's, give this a shot. It's a headbanger, for better or worse.